The national installer network of america is an organization formed to serve both manufacturers and installers alike. 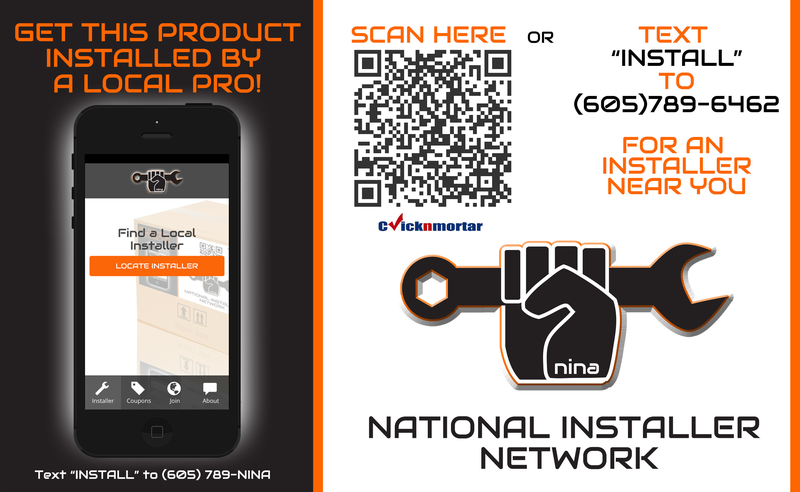 For installers NINA drives consumers to brick and mortar stores whenever they scan the QR code or text the word "Install" to the number on the label on participating manufacturers boxes. Manufacturers benefit by having their products professionally installed and demonstrating their support for jobbers and installer sin the brick and mortar community. Installers will support the brands that support them. Fine Print: Get 20% off all Advantage Running Boards purchased at www.runningboards.com. NINA provides a unique QR code to leading accessory manufacturers who use them on the sides of their boxes. Now when their products are sold online, consumers are able to quickly and easily find an installer in their area. The automotive industry consists of two components: sales and service. Internet retail giants focus largely on sales, but ignore the service component. NINA provides the service element to the sales that are conducted online. Sign Up and Start Getting Installations today! Is your business already listed in our system? To become a NINA member please fill out the application below accurately and completely. Start sending your installations to the NINA jobbers and installers today! Jobbers support brands who support them. Your business listing has been clicked times by customers looking for a local installer. You have of 5 free clicks remaining. To keep receiving local installations from NINA's brand partners sign up for our premium membership for $99/month. We went ahead and filled out some of the information for you below. To claim your business make sure you update and fill out the application accurately and completely. We will email you a receipt and take it from here! Now that this NINA has been approved you can view it at any time by coming here to the My NINAs section and clicking on Outstanding NINAs. You are about to delete your account. You are about to delete a user.